South America is the fourth largest continent in the world, it has an area of 17,840,000 square kilometers, as of 2005 the population of the continent was somewhere around 371,090,00, which makes it the fifth most populated continent. Apart from this reason, South America is famous for many other things. It is one of the most biodiverse continents on the planet, the species found there are extremely unique, the first sign of human life documented dates back to 9000 BC and food was being cultivated since 2000 BCE. 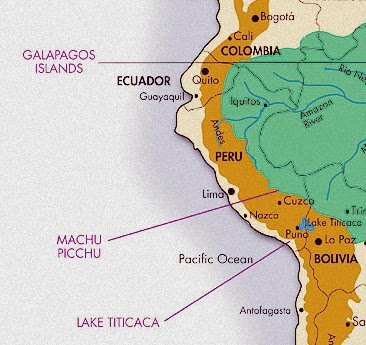 There are literally hundreds of places in the continent which actually put South America on the fame map, and two of those places are Peru and the Galapagos Islands. The Galapagos Islands needs no introduction. These tiny parts of land stretched on either side of the Equator belongs to the Republic of Ecuador, also known as the tourist hub of the continent. Ok they are famous, but Jewels of South America, seriously? Well, read on and be the judge. Peru, which is also known as the Land of the Inca, lies in the western hemisphere of the continent. This country was home to some of the oldest civilizations in the world, the Norte Chico to the Inca civilizations. Ancient Peruvian history dates back to exactly 9000 BCE, which makes it one of the oldest living countries on the planet today. So why is this, the jewel of South America? Well for one thing, its old and unique, 9000 BCE is a pretty big deal.